Buddhism (also known as Buddha Dharma, Pali: बुद्ध धम्म, "the teachings of the awakened one") is a dharmic, non-theistic religion, a way of life, a practical philosophy, and a life-enhancing system of applied psychology. Buddhism focuses on the teachings of Gautama Buddha (Pali: गौतम बुद्ध), hereinafter referred to as "the Buddha", who was born in Kapilavastu in what is now Nepal around the fifth century BCE. Buddhism spread throughout the Indian subcontinent in the five centuries following the Buddha's passing, and thence into Central, Southeast, and East Asia over the next two millennia. Vajrayana, which developed from, and is sometimes still classified with, Mahayana. Theravada is still practiced in certain parts of South Asia (mostly Sri Lanka) and Southeast Asia; Mahayana is practiced predominantly in East Asia; and the esoteric Vajrayana is followed in Tibet and Mongolia. The earlier non-Theravada Hinayana schools of thought that stemmed from India largely died out a millennium ago. Buddhism continues to attract followers worldwide and is considered a major world religion. According to one source ( ), "World estimates for Buddhists vary between 230 and 500 million, with most around 350 million." However, estimates are uncertain for several countries. Buddhism is the fifth-largest religion in the world behind Christianity, Islam, Hinduism, and traditional Chinese religion, respectively. The monks' order Sangha, which began during the lifetime of the Buddha in India, is amongst the oldest organizations on earth. When used in a generic sense, a buddha is generally considered to be a person who discovers the true nature of reality through years of spiritual cultivation, investigation of the various religious practices of his time, and meditation. This transformational discovery is called bodhi (literally, "awakening" — more commonly called "enlightenment"). Any person who has awakened from the "sleep of ignorance" by directly realizing the true nature of reality is called a buddha. The Buddha is said to have been only the latest of many of these; there were other buddhas before him and there will be others in the future. According to the Buddha, any person can follow his example and become enlightened through the study of his words (" Dharma") and putting them into practice, by leading a virtuous, moral life, and purifying the mind. The aim of Buddhist practice is to put an end to the sorrow (dukkha, Sanskrit/Pali: दुक्ख) of existence. In the words of the Buddha: "I teach one thing and one thing only: suffering and the end of suffering". To achieve this state of the end of suffering ( Nirvana or Nirodha), adherents train and purify the mind by following the Four Noble Truths and the Noble Eightfold Path, eventually arriving at an understanding of the true nature of all things. In this way all ignorance and unhappiness ends, and liberation is attained. Buddhist teaching encourages individuals to practice and verify the Buddha's teachings based on their own personal experience, and also after consulting with 'the wise'. If they find the teachings are valid (leading to more happiness and less suffering), they can apply these teachings in a practical form into their daily life if they so wish. Gautama Buddha, Gandhara, northern Pakistan. Numerous distinct groups have developed since the passing of the Buddha, with diverse teachings that vary widely in practice, philosophical emphasis, and culture. However, there are certain doctrines which are common to the majority of schools and traditions in Buddhism. The Buddha taught that in life there exists sorrow / suffering which is caused by desire and it can be cured (ceased) by following the Noble Eightfold Path (Sanskrit: Ārya 'aṣṭāṅga Mārgaḥ , Pāli: Ariyo Aṭṭhaṅgiko Maggo). This teaching is called the Catvāry Āryasatyāni (Pali: Cattāri Ariyasaccāni), the " Four Noble Truths". Suffering: Birth is suffering, aging is suffering, illness is suffering, death is suffering; union with what is displeasing is suffering; separation from what is pleasing is suffering; not to get what one wants is suffering; in brief, the five aggregates subject to clinging are suffering. The cause of suffering: The desire which leads to renewed existence (rebirth). The cessation of suffering: The cessation of desire. The Four Noble Truths was the topic of the first sermon given by the Buddha after his enlightenment, which was given to the ascetics with whom he had practiced austerities. The Four Noble Truths were originally spoken by the Buddha, not in the form of a religious or philosophical text, but in the form of a common medical prescription of the time. 1. The “Stream-Entrant” (Bhikku) catches a glimpse of Nirvana, understands the concept of non-self and eliminates the possibility of being reborn in the lower realms of existence. They also develop a strong faith in the Buddha, the Dhamma and the Sangha (also known as the Triple Gem) and will only be reborn a maximum of seven more lives. 2. The “Once-Returner” (Arhant) eliminates sensual desires and will be born into the human world only once more. 3. The “Non-Returner” (Boddhisattva) after passing away from the human realm is born in the "Brahma" heaven, where the body does not exist as desire and delusion have been destroyed. After achieving this stage the person has already destroyed the first 5 fetters. 4. The “Holy One” (Buddha) is completely pure and free from desire, delusion and ignorance. That person has experienced Nirvana and will know it fully at death, when all matter, sensations, perceptions, mental formations, and consciousness will disappear forever. The eight-spoked Dharmachakra. The eight spokes represent the Noble Eightfold Path of Buddhism. According to the Buddha, if a person does not follow the goal of Total Realization, one lives one's life like a preoccupied child playing with toys in a house that is burning to the ground. The word samyak means "perfect". There are a number of ways to interpret the Eightfold Path. On one hand, the Eightfold Path is spoken of as being a progressive series of stages through which the practitioner moves, the culmination of one leading to the beginning of another, whereas others see the states of the 'Path' as requiring simultaneous development. It is also common to categorize the Eightfold Path into prajñā (Pāli paññā, wisdom), śīla (Pāli sīla, virtuous behaviour) and samādhi (concentration). Bodhi ( Pāli and Sanskrit बॊधि, lit. awakening) is a title given in Buddhism to the specific awakening experience attained by the Buddha. After attainment of Bodhi, it is believed one is freed from the cycle of saṃsāra: birth, suffering, death and rebirth. Bodhi is attained only by the accomplishment of the pāramitās (perfections), when the Four Noble Truths are fully grasped, and when all karma has reached cessation. At this moment, all greed (lobha), hatred (Pali doṣa, delusion (moha), ignorance (Sanskrit avidyā, Pāli avijjā), craving (Sanskrit त्र्श्ण, [[tṛṣṇā]], Pāli taṇhā) and belief in that which is not the self ( anātmān, Pāli anāttā) are extinguished. Bodhi thus implies understanding of anātman (Pāli anatta), the absence of ego-centeredness. All schools of Buddhism recognise three types of Bodhi. They are Śrāvakabodhi (Pāli: Sāvakabodhi), Pratyekabodhi (Pāli: Paccekabodhi) and Samyaksambodhi (Pāli: Sammāsambodhi), the perfect enlightenment by which a Bodhisattva becomes a fully enlightened Buddha. The aspiration to attain the state of samyaksambodhi, known as the Bodhisattva ideal, is considered as the highest ideal of Buddhism. “Intention, monks, is karma I say. Having willed, one acts through body, speech and mind”. In Buddhism, Karma has a specific meaning quite different from other teachings. Karma means action derived from mental intent or volition and its result ( Vipaka) or its effect upon the doer of that volitional deed (be that deed one of thought, word or physical action). The primary guiding principle of Buddhist practice is the Middle Way which was discovered by the Buddha prior to his enlightenment ( bodhi). The Middle Way or Middle Path is often described as the practice of non-extremism; a path of moderation away from the extremes of self-indulgence and opposing self-mortification. 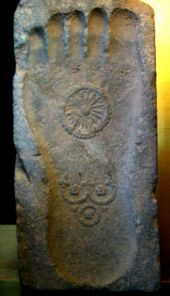 Footprint of the Buddha with Dharmacakra and triratna, 1st century CE, Gandhāra. Acknowledging the Four Noble Truths and making the first step in the Noble Eightfold Path requires taking refuge, as the foundation of one's religious practice, in Buddhism's Three Jewels (Sanskrit: त्रिरत्न Triratna or रत्नत्रय Ratna-traya, Pali: तिरतन Tiratana). The buddha who chooses the bodhisattva path makes a vow/pledge. This is considered the ultimate expression of compassion. The Buddha (i.e., Awakened One). This is a title for those who attained enlightenment similar to the Buddha and helped others to attain it. See also the Tathāgata and Śākyamuni Buddha. The Buddha could also be represented as the wisdom that understands Dharma, and in this regard the Buddha represents the perfect wisdom that sees reality in its true form. The Dharma: The teachings or law as expounded by the Buddha. Dharma also means the law of nature based on behaviour of a person and its consequences to be experienced (action and reaction). The Sangha: This term literally means "group" or "congregation," but when it is used in Buddhist teaching the word refers to one of two very specific kinds of groups: either the community of Buddhist monastics (bhikkhus and bhikkhunis), or the community of people who have attained at least the first stage of Awakening (Sotapanna ( pali सॊतपन्न) - one who has entered the stream to enlightenment). It also consists of laywomen and laymen, the caretakers of the monks, those who have accepted parts of the monastic code but who have not been ordained as monks or nuns. The Buddha presented himself as a model and beseeched his followers to have faith (Sanskrit श्रद्ध śraddhā, Pāli saddhā) in his example of a human who escaped the pain and danger of existence. The Dharma, i.e. the teaching of the Buddha, offers a refuge by providing guidelines for the alleviation of suffering and the attainment of enlightenment. 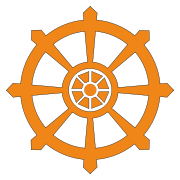 The Saṅgha (Buddhist Order of monks) provides a refuge by preserving the authentic teachings of the Buddha and providing further examples that the truth of the Buddha's teachings is attainable. Many Buddhists believe that there is no otherworldly salvation from one's karma. The suffering caused by the karmic effects of previous thoughts, words and deeds can be alleviated by following the Noble Eightfold Path, although the Buddha of some Mahayana sutras, such as the Lotus Sutra, the Angulimaliya Sutra and the Nirvana Sutra, also teaches that powerful sutras such as the above-named can, through the very act of their being heard or recited, wipe out great swathes of negative karma. Śīla (Sanskrit) or sīla ( Pāli) is usually rendered into English as "behavioural discipline", "morality", or ethics. It is often translated as "precept". It is an action that is an intentional effort. It is one of the three practices (sila - samadhi - panya) and the second pāramitā. It refers to moral purity of thought, word, and deed. The four conditions of śīla are chastity, calmness, quiet, and extinguishment, i.e. no longer being susceptible to perturbation by the passions. Sīla refers to overall (principles of) ethical behaviour. There are several levels of sila, which correspond to 'basic morality' ( five precepts), 'basic morality with asceticism' ( eight precepts), 'novice monkhood' ( ten precepts) and 'monkhood' (Vinaya or Patimokkha). Lay people generally undertake to live by the five precepts which are common to all Buddhist schools. If they wish, they can choose to undertake the eight precepts, which have some additional precepts of basic asceticism. The five precepts are not given in the form of commands such as "thou shalt not ...", but are training rules in order to live a better life in which one is happy, without worries, and can meditate well. 2. To refrain from taking that which is not freely given (i.e. not committing theft). 3. To refrain from sensual misconduct (abstinence from immoral sexual behaviour). 5. To refrain from intoxicants which lead to loss of mindfulness. In the eight precepts, the third precept on sexual misconduct is made more strict, and becomes a precept of celibacy. 6. To refrain from eating at the wrong time (only eat from sunrise to noon). 7. To refrain from dancing, using jewellery, going to shows, etc. 8. To refrain from using a high, luxurious bed. Vinaya is the specific moral code for monks. In includes the Patimokkha, a set of 227 rules in the Theravadin recension. The precise content of the vinayapitaka (scriptures on Vinaya) differ slightly according to different schools, and different schools or subschools set different standards for the degree of adherence to Vinaya. Novice-monks use the ten precepts, which are the basic precepts for monastics. In Mahayana Buddhism, there is also a distinctive Vinaya and ethics contained within the Mahayana Brahmajala Sutra (not to be confused with the Pali text of that name) for Bodhisattvas, where, for example, the eating of meat is frowned upon and vegetarianism is actively encouraged (see vegetarianism in Buddhism). In the language of the Noble Eightfold Path, samyaksamādhi is "right concentration". The primary means of cultivating samādhi is meditation. Almost all Buddhist schools agree that the Buddha taught two types of meditation, viz. samatha meditation (Sanskrit: śamatha) and vipassanā meditation (Sanskrit: vipaśyanā). Upon development of samādhi, one's mind becomes purified of defilement, calm, tranquil, and luminous. Once the meditator achieves a strong and powerful concentration ( jhāna, Sanskrit ध्यानम् dhyāna), his mind is ready to penetrate and gain insight ( vipassanā) into the ultimate nature of reality, eventually obtaining release from all suffering. The cultivation of mindfulness is essential to mental concentration, which is needed to achieve insight. Samatha Meditation starts from being mindful to an object or idea, which is expanded to one's body, mind and entire surroundings, leading to a state of total concentration and tranquility (jhāna) There are many variations in the style of meditation, from sitting cross-legged or kneeling to chanting or walking. The most common method of meditation is to concentrate on one's breath, because this practice can lead to both samatha and vipassana. In Buddhist practice, it is said that while samatha meditation can calm the mind, only vipassanā meditation can reveal how the mind was disturbed to start with, which is what leads to jñāna (Pāli ñāṇa knowledge) vijñāna (Pāli viññāṇa awareness), prajñā (Pāli paññā pure understanding) and thus can lead to nirvāṇa (Pāli nibbāna). Prajñā (Sanskrit प्रञ) or paññā ( Pāli पन्न) means wisdom that is based on a realization of dependent origination, The Four Noble Truths and Noble Eightfold Path. Prajñā is the wisdom that is able to extinguish afflictions and bring about bodhi. It is spoken of as the principal means, by its enlightenment, of attaining nirvāṇa, through its revelation of the true nature of all things. Prajñā is also listed as the sixth of the six pāramitās. Initially, prajñā is attained at a conceptual level by means of listening to sermons (dharma talks), reading and sometimes reciting Buddhist texts and engaging in discourse. The Buddha taught dharma to his disciples mainly through the mean of discourse or sermon, many attaining bodhi upon hearing the Buddha's discourse. Once the conceptual understanding is attained, it is applied to daily life so that each Buddhist can verify the truth of the Buddha's teaching at a practical level. Lastly, one engages in insight ( vipassanā, Sanskrit vipaśyanā) meditation (Citation needed) to attain such wisdom at intuitive level. It should be noted that one could theoretically attain bodhi at any point of practice, while listening to a sermon, while conducting business of daily life or while in meditation. Soon after the parinirvāṇa (Pāli: parinibbāna, "complete extinguishment") of the Buddha, the first Buddhist council was held. As with any ancient Indian tradition, transmission of teaching was done orally. The primary purpose of the assembly was to collectively recite the teaching to ensure that no errors occur in oral transmission. In the first council, Ānanda, the Buddha's personal attendant was called upon to recite the discourses ( sūtras, Pāli suttas) of the Buddha. Upāli, another disciple, recited the monastic rules (Vinaya). As the Saṅgha gradually grew over the next century a dispute arose regarding nine (subtle) points of discipline. A Second Buddhist Council (traditionally believed to have taken place 100 years after the Buddha's death) was held to resolve the points at dispute, and these were resolved. The result was that those 9 practices were declared unallowed according to Vinaya. After the second council however, some schisms occurred, and to resolve those schism and determine orthodoxy, a Third Buddhist Council was held at Pataliputta. These schisms occurred within the traditions of Early Buddhism, at a time when the Mahāyāna movement either did not exist at all, or only existed as a current of thought not yet identified with a separate school. One of the basic schisms was between the Sthaviras and the Mahāsāṅghikas. The fortunate survival of accounts of schisms from both sides of the dispute reveals disparate traditions; the Sthaviras claimed that the Mahāsāṅghikas were trying to dilute the Vinaya by ignoring certain rules; the Mahāsāṅghikas argued that the Sthaviras were trying to expand the Vinaya by illegitimately introducing new rules not sanctioned by the Buddha; they may also have challenged what they perceived to be excessive claims or inhumanly high criteria for Arhatship. Both parties, therefore, appealed to tradition. The Sthaviras gave rise to several schools, one of which was the Theravāda school. Following (or leading up to) the schisms, each Saṅgha started to accumulate an Abhidharma, a collection of philosophical commentaries on the discourse of the Buddha. Such commentaries probably existed in the time of the Buddha as very early of simple lists. However, as time went on and Buddhism spread further, the (perceived) teachings of the Buddha were formalized in a more systematic manner in a new Pitaka: the Abhidhamma Pitaka. Some modern academics refer to it as Abhidhamma Buddhism. Interestingly, the Mahasanghika school did not have an Abhidhamma Pitaka, which agrees with their statement that they did not want to add to the Buddha's teachings. But according to Chinese pilgrims Fa Xian (5th century CE) and Yuan Chwang (7th century CE), they had procured a copy of Abhidhamma which belonged to the Mahasanghika School. Buddhist proselytism at the time of emperor Aśoka the Great (260–218 BCE). Buddhism spread slowly in India until the time of the Mauryan emperor Aśoka the Great, who was a public supporter of the religion. The support of Aśoka and his descendants led to the construction of more Buddhist religious memorials ( stūpas) and to efforts to spread Buddhism throughout the enlarged Maurya empire and even into neighboring lands – particularly to the Iranian-speaking regions of Afghanistan and Central Asia, beyond the Mauryas' northwest border, and to the island of Sri Lanka south of India. These two missions, in opposite directions, would ultimately lead, in the first case to the spread of Buddhism into China, and in the second case, to the emergence of Theravāda Buddhism and its spread from Sri Lanka to the coastal lands of Southeast Asia. This period marks the first spread of Buddhism beyond India. According to the edicts of Aśoka, emissaries were sent to various countries west of India in order to spread "Dhamma", particularly in eastern provinces of the neighboring Seleucid Empire, and possibly even farther to Hellenistic kingdoms of the Mediterranean. This led, a century later, to the emergence of Greek-speaking Buddhist monarchs in the Indo-Greek Kingdom, and to the development of the Greco-Buddhist art of Gandhāra. During this period Buddhism was exposed to a variety of influences, from Persian and Greek civilization, and from changing trends in non-Buddhist Indian religions – themselves influenced by Buddhism. In addition to the Edicts of Aśoka, Buddhist annals compiled at a later date offer a history of the Aśokan and post-Aśokan period. Among these annals are the Dīpavaṃsa, the Mahāvaṃsa, and the Samantapāsādika of the south Indian Vibhajjavāda (Sanskrit: Vibhajyavāda) saṅgha, beside the Divyāvadāna and the Avadānaśataka from the northern Sarvāstivāda ( Pāli: Sabbatthivāda) saṅgha. According to the accounts of the Vibhajjavāda, Aśoka convened a third Buddhist council (c. 250 BCE), whose purpose was to produce a definitive text of the Buddha's words. The result, according to the Vibhajjavādins, was the compilation of the version of the Tripiṭaka (Pāli: Tipiṭaka) found in the Pāli Canon. The council also saw the formation of the saṅgha of the Vibhajjavāda ("school of analytical discourse") out of various schools of the Sthaviravāda lineage. Vibhajjavādins claim that the first step to insight has to be achieved by the aspirant's experience, critical investigation, and reasoning instead of by blind faith. This school gradually declined on the Indian subcontinent, but its branch in Sri Lanka and South East Asia continues to survive; this branch of the school is now known as Theravada. The Theravāda school claims that the Sarvāstivada and the Dharmaguptaka schools were rejected by the council, although according to other sources the Dharmaguptaka school is classified as one of the Vibhajyavādin schools. However, these schools became influential in northwestern India and Central Asia and, since their teaching is found among the scriptures preserved by the Mahāyāna schools, they may have had some formative influence on the Mahāyāna. The Sarvāstivadins have not preserved an independent tradition about the Third Council. It was long believed in Theravāda tradition that the Pāli language is equivalent to Māgadhī, the eastern dialect of the kingdom of Magadha spoken by the Buddha. However, linguistic comparisons of the Edicts of Aśoka and the language of the Pāli canon show strong differences between the Māgadhī of the Edicts (characterized by such changes as r → l, masculine nominative singular of a-stems in -e, etc.) and Pāli. The greatest similarity to Pāli is found in a dialectal variant of the Edicts written on a rock near Girnar in Gujarat. 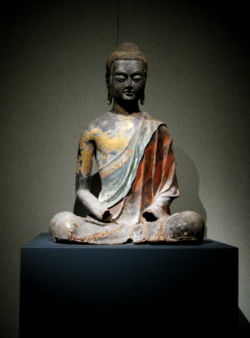 Chinese Seated Buddha, Tang dynasty, Hebei province, ca. 650 CE. Chinese Buddhism is of the Mahayana tradition, with popular schools today being Pure Land and Zen. Expansion of Mahayana Buddhism between the 1st – 10th century CE. 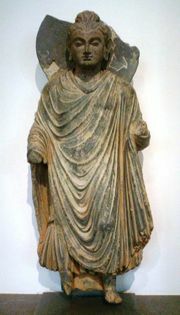 Around 100 CE, the Kushan emperor Kanishka convened the fourth Buddhist council and is usually associated with the formal rise of Mahayana Buddhism. This council is not recognised by Theravada line of Buddhism. This council did not simply rely on the original Tripitaka in the third council. Instead, a set of new scriptures, mostly notably, the Lotus Sutra, an early version of the Heart Sutra and the Amitabha Sutra were approved, as well as fundamental principles of doctrine based around the concept of salvation for the masses (hence Mahāyāna "great vehicle") and the concept of Buddhas and bodhisattva who embody transcendent Buddha-nature who strive to achieve such goal. The new scriptures were first written in Sanskrit. From that point on, and in the space of a few centuries, Mahayana would flourish and spread from the India to Southeast Asia, and towards the north to Central Asia and then east to China where Mahayana was Sinicized and this Sinicized Mahayana would be passed on to Korea, Vietnam and finally to Japan in 538 CE. The East Asians would go on to write more indigenous sutras and commentaries to the Mahayana Canon. The most complete Mahayana Canon today is in the Chinese language. The Wheel of Life from the country Bhutan. 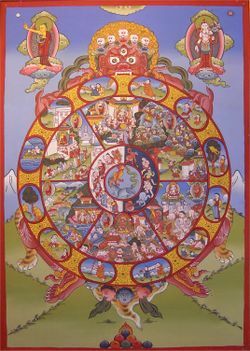 The Wheel of Life is used predominantly today in the Vajrayana tradition of Buddhism. Mahāyāna Buddhism received significant theoretical grounding from Nāgārjuna (c.150 - 250 CE), arguably the most influential scholar within the Mahāyāna tradition. From studying his writings, it is clear that Nāgārjuna was conversant with both the Nikāya (Hīnayāna) philosophies and the emerging Mahāyāna tradition. He made explicit references to Mahāyāna texts, but his philosophy was argued within the parameters set out by the Tripiṭaka sūtras. Completely repudiating the then-dominant Sarvāstivāda school, which argued for the existence of dharmas (factors of existence) in past, present, and future, Nāgārjuna asserted that the nature of the dharmas (hence the enlightenment) to be śūnya (void or empty), bringing together other key Buddhist doctrines, particularly anātman (no-self) and pratītyasamutpāda (dependent origination). His school of thought is known as the Madhyamaka. After the end of the Kuṣāṇas, Buddhism flourished in India during the dynasty of the Guptas (4th – 6th century). Mahāyāna centres of learning were established, the most important one being the Nālandā University in north-eastern India. Sarvāstivāda teaching, which was criticized by Nāgārjuna was reformulated by scholars such as Vasubandhu and Asaṅga and were incorporated into the Yogācāra (Sanskrit: yoga practice) school. While the Madhyamaka school asserted that there is no ultimately real thing, the Yogācāra school asserts that only the mind is ultimately existent. These two schools of thought, in opposition or synthesis, form the basis of subsequent Mahāyāna theology. There are differing views as to just when Vajrayāna and its tantric practice started. In the Tibetan tradition, it is claimed that the historical Śākyamuni Buddha taught tantra, but as these are esoteric teachings, they were written down long after the Buddha's other teachings. The earliest texts appeared around the early 4th century. Nālandā University became a centre for the development of Vajrayāna theory and continued as the source of leading-edge Vajrayāna practices up through the 11th century. These practices, scriptures and theory were transmitted to China, Tibet, Indochina and Southeast Asia. China generally received Indian transmission up to the 11th century including tantric practice, while a vast amount of what is considered to be Tibetan Buddhism (Vajrayāna) stems from the late (9th-12th century) Nālandā tradition. Buddhism was established in the northern regions of India and Central Asia, and kingdoms with Buddhist rulers such as Menander I and Kaniska. Under the rule of tolerant or even sympathetic Greco-Bactrian and Iranian Achaemenid kings, Buddhism flourished. The rulers of the Kushāna Empire adopted Buddhism, and it continued to thrive in the region under the rule of the Turk-Shāhīs. Buddhists were briefly persecuted under the Zoroastrian priest-king Kirder. Syncretism between Zoroastrianism and Buddhism had resulted in the rise of a 'Buddha-Mazda' divinity, which Kirder treated as heresy. The Hinayana traditions first spread among the Turkic tribes before combining with the Mahayana forms during the 2nd and 3rd centuries BCE to cover modern-day Pakistan, Kashmir, Afghanistan, eastern and coastal Iran, Uzbekistan, Turkmenistan and Tajikistan. These were the ancient states of Gandhara, Bactria, Parthia and Sogdia from where it spread to China. Among the first of these Turkic tribes to adopt Buddhism was the Turki- Shahi who adopted Buddhism as early as the 3rd century BCE. It was not, however, the exclusive faith of this region. There were also Zoroastrians, Hindus, Nestorian Christians, Jews, Manichaeans, and followers of shamanism, Tengrism, and other indigenous, nonorganized systems of belief. From the 4th Century CE on, Hindu dynasties had achieved preeminence elsewhere in India. Even in regions of Buddhist predominance, such as the northwest ( Pañjāb) and the lower Gangetic plain ( Uttar Pradesh and Bengal), the Indian caste system and other characteristics of Hinduism were found. In political contests between Hindu and Buddhist kingdoms, Buddhist rulers were gradually replaced by Hindu ones. By the 4th to 5th century Buddhism was already in decline in northern India, even though it was achieving multiple successes in Central Asia and along the Silk Road as far as China. The Buddhist states of Central Asia were weakened in the 6th century following the invasion of the White Huns and Buddhism suffered as recorded by Xuanzang. Later Buddhist regions in Central Asia came either under the sway of the Persian Sāsānids or Tibet. When the Muslim Arabs overthrew the Sāssānids they encountered Buddhists in the eastern provinces of the Persian Empire. They called them by the Persian name of butparast, literally meaning "buddha-worshipper", although the term has come to be used generally for any religion in which cult images play a role. Several high officials of the Abbāsid Caliphate, notably the Barmakids, were descended from these East Iranian Buddhists. When Muhammad ibn Qāsim led the invasion of Sindh at the mouth of the Indus river, he was aided by some Buddhists in his campaign against their Hindu overlord, Rājā Dahir. Relations with later Iranian rulers such as the Saffarids and Samanids were more difficult; Buddhist monasteries and stūpas were not exempt from looting under Arab rule. After the disintegration of the Abbāsid Caliphate, the Muslim Turks rose to prominence among the Persian emirates that emerged in Central Asia and Afghanistan. In the 10th century CE, one of them, Mahmūd of Ghaznī, defeated the Hindō-Shāhīs and finally brought the region firmly under Muslim rule through Afghanistan and the Pañjāb. He demolished monasteries alongside temples during his raid across north-western India but left those within his domains and Afghanistan alone and al-Biruni recorded the Buddha as a prophet "burxan". The originally pagan Turkic tribes who lived in western Central Asia converted to Islām as they came to be increasingly influenced by Persian culture. As the Turkic tribes of Central Asia battled for control of land, similarly an ideological battle waged within them as Sufis, faced with an increasing hostile environment in Arabia, moved to Transoxania and found fertile ground here for converts among the Buddhist and non-Buddhist Turkic tribes alike. Buddhism persisted, together with Christianity, Manichaeism, Zoroastrianism, and shamanism in areas to the east (modern Xinjiang) for several centuries, which did not become overwhelmingly Muslim until the 15th century CE; however, under the two-pronged onslaught Buddhism waned and over time Central Asia gradually became predominantly Muslim. In 1215 Genghis Khan conquered Afghanistan and his horde devastated the local population indiscriminately; in 1227 after his death his conquest was divided and Chagatai established the Chagatai Khanate while Hulegu established the Il Khanate where Buddhism was the state religion across Muslim lands. In the Chagatai Khanate the Buddhist Turkic tribes slowly converted to Islam, including the occasional Khan . When Tarmashirin came to power he made Islam the official religion of the region in 1326. In the Il Khanate, Hulegu and his successors Abaqa and Arghun also established Buddhism as the state religion but were hostile to the Muslims. Many mosques were destroyed and numerous stupas built; however, when Ghazan came to power in 1295 and converted he reverted the state religion to Islam and the climate became hostile towards Buddhism. Today no stupas built by the earlier Mongol Khans survive, and after Ghazan's reign little mention of Buddhism can be found in Afghanistan and Central Asia. Buddhists retained power in parts of northern India, in Kaśmīr and especially in Bengal, where the Buddhist Pāla kings ruled from the 8th-12th centuries CE. These last Buddhist strongholds played an important role in the evolution of the Vajrayāna and the transmission of that form of Buddhism to Tibet before they collapsed under assault from the Hindu Sena dynasty. Elsewhere in India, Buddhism suffered from pressure by Hindu dynasties, such as the increasingly powerful Rajputs, as well as competition from a Hinduism that had gained ideological coherence and emotional vigor from such movements as Vedānta philosophy and Bhakti devotionalism. One symptom of increased Hindu confidence with regard to Buddhism was the identification of the Buddha as an avatāra of the Hindu god Vishnu – an identification which contradicted basic Buddhist understandings about the nature of a Buddha and of nirvāna. In 1193, only a few decades after the fall of the Pāla kingdom, Muhammad Khiljī destroyed Nālandā, the great Buddhist university. Khiljī was one of the generals of Qutbuddīn Aybak, a subject of the Afghan Ghurids but soon to become the monarch of a Muslim sultanate at Delhi. Khiljī's march across northern India caused a precipitous decline in the fortunes of Indian Buddhism, as he destroyed Buddhist walled monasteries fortified by the Sena kings (which he thought were cities), killed the monks and burned their libraries. After the Mongol invasions of Islamic lands across Central Asia, many Sufis also found themselves fleeing towards the newly established Islamic lands in India around the environs of Bengal. Here their influence, caste attitudes towards Buddhists, previous familiarity with Buddhism, lack of Buddhist political power or social structure along with Hinduism's revival movements such as Advaita and the rise of the syncretic bhakti movement, all contributed to a significant realignment of beliefs relegating Buddhism in India to the peripheries. By the 13th century CE, Buddhism had become a marginal religion in central India; without a monastic infrastructure, Buddhism could not easily maintain its identity, and many Buddhists, especially in Bengal, were converted to Islām, Hinduism or left for the Himalayan foothills. In Kaśmīr Buddhism remained a significant religion down to the early 15th century, when it was displaced by Islām and Hinduism, except among the Tibetan peoples of Ladakh. Elements of Buddhism have remained within India to the current day: the Bauls of Bengal have a syncretic set of practices with strong emphasis on many Buddhist concepts. Other areas of India have never parted from Buddhism, including Ladakh and other Himalayan regions with a primarily Tibetan population. Arunachal Pradesh and Sikkim are the other Indian states where Buddhism is practiced in great numbers. The Newars of Nepal also retain a form of Buddhism that differs from the Buddhism of Tibet. Furthermore, much of Buddhist philosophy was eventually absorbed into Hinduism. 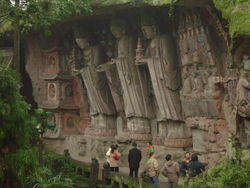 Rock carvings at Dazu near Chongqing, China. Buddhist schools are usually divided into two main branches: Theravāda Buddhism and Mahāyāna Buddhism. Vajrayāna is sometimes named as a third, but is more commonly considered a form of Mahāyāna Buddhism. Another way of categorizing Buddhist schools follows the major languages of the extant Buddhist canons, which exist in Pāli, Tibetan (also found in Mongolian translation) and Chinese collections, along with some texts that still exist in Sanskrit and Buddhist Hybrid Sanskrit. This is a useful division for practical purposes, but does not necessarily correspond to philosophical or doctrinal divisions. All accept the Buddha as their teacher. All accept the Middle Way, Dependent origination, the Four Noble Truths and the Noble Eightfold Path. All accept that both the members of the laity and of the Sangha can pursue the path toward enlightenment ( bodhi). All accept two types of Buddha and consider Buddhahood to be the highest attainment. The Theravāda school bases its practice and doctrine exclusively on the Pāli Canon and its commentaries. The Sutta collections and Vinaya texts of the Pāli Canon (and the corresponding texts in other versions of the Tripitaka), are generally considered by modern scholars to be the earliest Buddhist literature, and they are accepted as authentic in every branch of Buddhism. Theravāda is the only surviving representative of the historical early Buddhist schools. Theravāda is primarily practiced today in Sri Lanka, Myanmar, Laos, Thailand, Cambodia as well as small portions of China, Vietnam, Malaysia and Singapore. It has a growing presence in Europe and America. 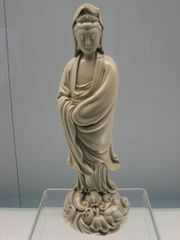 Chinese Ming dynasty porcelain figure of Guanyin, "Goddess of Mercy." Mahayana is an inclusive faith characterized by the adoption of new texts, in addition to the traditional Pali canon, and a shift in the understanding of Buddhism. It goes beyond the traditional Theravada ideal of the release from suffering ( dukkha) and personal enlightenment of the arhats, to elevate the Buddha to a God-like status, and to create a pantheon of quasi-divine Bodhisattvas devoting themselves to personal excellence, ultimate knowledge and the salvation of humanity. In Mahayana, the Buddha became an idealized man-god and the Bodhisattva was the universal ideal of excellence. The Mahayana branch emphasizes infinite, universal compassion (maha-karuna) or the selfless, ultra-altruistic quest of the Bodhisattva to attain the "Awakened Mind" ( bodhicitta) of Buddhahood so as to have the fullest possible knowledge of how most effectively to lead all sentient beings into Nirvana. Emphasis is also often placed on the notions of Emptiness ( shunyata, prajnaparamita and Buddha-nature. The Mahayana can also on occasion communicate a vision of the Buddha or Dharma which amounts to mysticism and give expression to a form of mentalist pantheism or panentheism ( God in Buddhism). 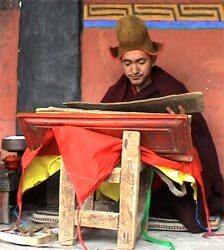 In addition to the Tripitaka scriptures, which (within Mahayana) are viewed as valid but only provisional or basic, Mahayana schools recognize all or part of a genre of Mahayana scriptures. Some of these sutras became for Mahayanists a manifestation of the Buddha himself. Mahayana Buddhism shows a great deal of doctrinal variation and development over time, and even more variation in terms of practice. While there is much agreement on general principles, there is disagreement over which texts are more authoritative. Native Mahayana Buddhism is practiced today in China, Japan, Korea and most of Vietnam. The Buddhism practiced in Tibet, the Himalayan regions, and Mongolia is also Mahayana in origin, but will be discussed below under the heading of Vajrayana. Two popular schools of Mahāyāna today are Chan/Zen and Pure Land. The Vajrayāna or "Diamond Vehicle" (also referred to as Mantrayāna, Tantrayāna, Tantric Buddhism, or esoteric Buddhism) shares the basic concepts of Mahāyāna, but also includes a vast array of spiritual techniques designed to enhance Buddhist practice. Vajrayāna Buddhism exists today in the form of two major sub-schools: Tibetan Buddhism and Shingon Buddhism. One component of the Vajrayāna is harnessing psycho-physical energy as a means of developing profoundly powerful states of concentration and awareness. These profound states are in turn to be used as an efficient path to Buddhahood. Using these techniques, it is claimed that a practitioner can achieve Buddhahood in one lifetime, or even as little as three years. In addition to the Theravāda and Mahāyāna scriptures, Vajrayāna Buddhists recognise a large body of texts that include the Buddhist Tantras. Native Vajrayāna is practiced today mainly in Tibet, Nepal, Bhutan, Mongolia, Kalmykia, Siberia, areas of India, and – in the Shingon (Zhènyān, 真言) and Tendai schools – in China and Japan. In his lifetime, the Buddha had not answered several philosophical questions. On issues like whether the world is eternal or non-eternal, finite or infinite, unity or separation of the body and the self, complete inexistence of a person after nirvana and then death, nature of the Supreme Truth, etc, the Buddha had remained silent. Commentators explain that such questions distract from practical activity for realizing enlightenment. "The mind of perfect purity [i.e. the Awakened Mind of Buddha] ... is beyond thinking and inexplicable ... It dwells in the self-perfected bliss which is deedless and self-perfected ... I am the best path of liberation. It is a path, subtle and difficult to understand, which is non-speculative and beyond thinking ... It cannot be captured in words ... It is firm, difficult to comprehend, and totally inexplicable." (The Sovereign All-Creating Mind tr. by E.K. Neumaier-Dargyay, pp. 111-112). Also later, the famous Indian Buddhist yogi and teacher mahasiddha Tilopa discouraged any intellectual activity in his 6 words of advice. Buddhist missionaries, however, often faced philosophical questions from other religions whose answers they themselves did not know. For those, who have attachment to intellectualism, Buddhist scholars produced a prodigious quantity of intellectual theories, philosophies and worldview concepts. See e.g. Abhidharma, Buddhist philosophy and Reality in Buddhism. The Vinaya Pitaka, containing disciplinary rules for the Sanghas of Buddhist monks and nuns, as well as a range of other texts including explanations of why and how rules were instituted, supporting material, and doctrinal clarification. The Sūtra Pitaka (Pāli: Sutta Pitaka), contains the actual discourses of the Buddha. The Abhidharma Pitaka (Pāli: Abhidhamma Pitaka) contains commentaries or systematic expositions of the Buddha's teachings. Soon after the death of the Buddha, the first Buddhist council was held; a monk named Mahākāśyapa (Pāli: Mahākassapa) presided. The goal of the council was to record the Buddha's sayings – sūtras (Sanskrit) or suttas (Pāli) – and codify monastic rules (Vinaya). Ānanda, the Buddha's personal attendant, was called upon to recite the discourses of the Buddha, and Upāli, another disciple, recited the rules of the Vinaya. These became the basis of the Tripitaka. However, this record was initially transmitted orally in form of chanting, and was committed to text in a much later period. Both the sūtras and the Vinaya of every Buddhist school contain a wide variety of elements including discourses on the Dharma, commentaries on other teachings, cosmological and cosmogonical texts, stories of the Buddha's previous lives, and lists relating to various subjects. The Theravāda and other Nikāya schools believe that the texts of their canon contain the actual words of the Buddha. The Theravāda canon, also known as the Pāli Canon after the language it was written in, contains some four million words. Other texts, such as the Mahāyāna sūtras, are also considered to be the word of the Buddha, but were transmitted either in secret, via lineages of mythical beings (such as the nāgas), or came directly from other Buddhas or bodhisattvas. Some six hundred Mahāyāna sutras have survived in Sanskrit or in Chinese or Tibetan translations. The followers of Theravāda Buddhism take the scriptures known as the Pāli Canon as definitive and authoritative, while the followers of Mahāyāna Buddhism base their faith and philosophy primarily on the Mahāyāna sūtras and their own versions of the Vinaya. The Pāli sutras, along with other, closely-related scriptures, are known to the other schools as the āgamas. Whereas the Theravādins adhere solely to the āgamas and their commentaries, the adherents of Mahāyāna accept both the agamas and the Mahāyāna sūtras as authentic and valid teachings of the Buddha, designed for different types of persons and different levels of spiritual penetration. For the Theravādins, however, the Mahayana sūtras are works of poetic fiction, not the words of the Buddha himself. The Theravadins are confident that the agamas represent the full and final statement by the Buddha of his Dhamma - and nothing more is truly needed beyond that. Anything added which claims to be the word of the Buddha and yet is not found in the Nikayas or their scholastic commentaries is treated with extreme caution if not outright rejection by Theravada. For the Mahāyānists, in contrast, the āgamas do indeed contain basic, foundational, and, therefore, relatively weighty pronouncements of the Buddha, but in their view, the Mahāyāna sutras articulate the Buddha's higher, more advanced and deeper doctrines, reserved for those who follow the exalted bodhisattva path. That path is built upon the motivation to achieve not only personal liberation, but Buddhahood itself in order to know how best to liberate all living beings from unhappiness. Hence the name Mahāyāna (lit., the Great Vehicle), which has room for both the general masses of sentient beings and those who are more developed. The "Great" of "Maha-yana" is indeed typical of much of this version of Buddhism - from the physical bigness (lengthiness) of some of the Mahayana sutras and the vastness of the Bodhisattva vow (to strive for all future time to help free other persons and creatures from pain), to the numbers of beings who are sought to be saved (infinitudes), to the (in some sutras and Tantras) final attainment of the Buddha's "Great Self" (mahatman) in the sphere of "Great Nirvana" (mahanirvana). For the Theravadins, however, this alleged "greatness" proclaimed by some Mahayana sutras does not necessarily equate to "true". Unlike many religions, Buddhism has no single central text that is universally referred to by all traditions. The size and complexity of the Buddhist canons have been seen by some (including Buddhist social reformer Babasaheb Ambedkar) as presenting barriers to the wider understanding of Buddhist philosophy. Over the years, various attempts have been made at synthesizing a single Buddhist text that will encompass all of the major principles of Buddhism. In the Theravada tradition, condensed 'study texts' were created that combined popular or influential scriptures into single volumes that could be studied by novice monks. Later in Sri Lanka, the Dhammapada was championed as a unifying scripture. Dwight Goddard collected what he felt was a representative sample of Buddhist scriptures- along with other classics of Eastern philosophy, such as the Tao Te Ching- into his Buddhist Bible in the 1920's. More recently, Dr. Babasaheb Ambedkar attempted to create a single, combined document of Buddhist principles with his “The Buddha and His Dhamma”. Other such efforts have persisted to the present day, but currently there is no single text widely accepted as being central to all Buddhist traditions. Estimates of the number of Buddhists vary, but the most common figure today is between 350 and 400 million. Theravāda Buddhism, using Pāli as its scriptural language, is the dominant form of Buddhism in Southeast Asia, Thailand, Sri Lanka, Myanmar and India. Mahāyāna forms of Buddhism that use scriptures in Chinese are dominant in most of China, Japan, Korea, Taiwan and Vietnam as well as the Chinese communities around the world, especially within Indochina and Southeast Asia as well as in the West. Vajrayāna Buddhism, using the Tibetan language, is found in Tibet and the surrounding area of India, Bhutan, Mongolia, Nepal, Tibet/China, and the Russian Federation. Poland, Denmark, Greece and the Russian Federation are the first European countries to recognize Buddhism as an official religion. The Indian Buddhist Movement is a revival of Buddhism in India. This movement was initiated by B. R. Ambedkar in 1956 with a mass conversion ceremony of Hindu Untouchables now known as Dalits. Their practice is general and they do not follow any particular Buddhist school of thought. At the present time, the teachings of all three branches of Buddhism have spread throughout the world, and Buddhist texts are increasingly translated into local languages. 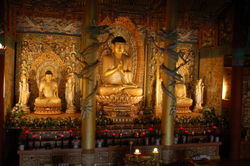 While in the West, Buddhism is often seen as exotic and progressive, in the East, Buddhism is regarded as familiar and part of the establishment. Buddhists in Asia are frequently well organised and well funded. In a number of countries, it is recognised as an official religion and receives state support. In the West, Buddhism is recognised as one of the growing spiritual influences. Buddhism is a fertile ground for comparative studies with different beliefs, philosophy, science, history, and various other aspects of Buddhism. In term of doctrine, dependent origination is Buddhism's primary contribution to metaphysics. This has wide-ranging implication in terms of theology, philosophy, and science. On the other hand, Buddhist emphasis on the Middle way not only provides a unique guideline for ethics but it has also allowed Buddhism to peacefully coexist with various local beliefs, customs, and institutions in adopted countries for most of its history.